It is incredibly important to us that residents continue to enjoy their favourite activities and hobbies. We also think that it is important that they have the opportunity to try new activities should they wish to. Fortunately, all of our care homes allow residents to take part in these activities in the safe and supported community that they live in. The variety of clubs, lifestyle choices and activities that we have available are tailored to what residents enjoy, as well as their individual needs. They can choose to join in with as many or as few as they like, though common favourites among the residents are regularly available through our lifestyle team and are always enhanced with new experiences where possible. This means that there are always things to do between visits from friends and family and no time to get bored. 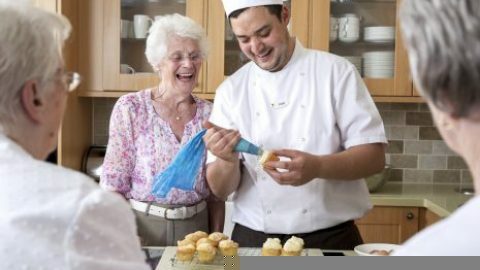 Some of the activities we offer range from outings to local places of interest to offer something memorable and different, to gentle exercise classes, arts and crafts, and cooking, all of which take place in the comfort of the care home community. Watch our video to get a taste of the activities on offer at Hallmark care homes. Within our care homes, we have beautifully designed facilities so residents feel at home and can also maintain their lifestyles with the support from the community around them. They could continue to keep up with their regular hair and nail appointment in one of our hair salons, take part in a spot of gardening and even relax in one of our luxurious therapy rooms to recuperate. We even have state-of-the-art cinemas, which are perfect for watching both classic movies and new releases! In some of our care homes around the country, you can also find a corner shop, where residents can ‘pop to the shop’ and pick up their daily paper or a snack when they see fit. When family and friends visit their loved ones in our care homes, they can all enjoy fresh coffee and homemade cakes in one of our welcoming cafés. We have designed every café with a friendly and comfortable environment in mind, allowing residents and their visitors to truly enjoy a catch-up. With a homely feel to the rest of the care home, we ensure that every resident can feel at ease and truly enjoy their day to day activities, whether they take part in the clubs and events or take some time out to relax. Here at Hallmark Care Homes, we encourage residents to complete an ‘About Me’ booklet that will give us an insight into their likes, dislikes, what they like to do and a bit more information about their history and life prior to moving to one of our care homes. This will not only allow our teams to get a better understanding of what’s needed as part of their care plan, but it helps us build valuable relationships with every resident, offering them a friendly face and full support as and when they need it. From all this information about a new resident, we then plan activities that we know they will enjoy, in order to make their time in our care homes inspiring and interesting. We make sure that care is tailor-made specifically to each individual and that it constantly makes them feel supported and part of a community. We work hard to ensure that residents don’t feel isolated or lonely during their time with us. No two days are the same at our care homes; through the smell of our freshly cooked food, residents can find the kitchen where they are able to assist our kitchen teams in preparing the daily meals before they tuck in themselves. We make sure that our care homes are inclusive and any ideas for activities that residents may have are listened to and organised, so they can indulge in a hobby or pastime that they have always loved. Hallmark in Bloom is a competitive event which is run annually. 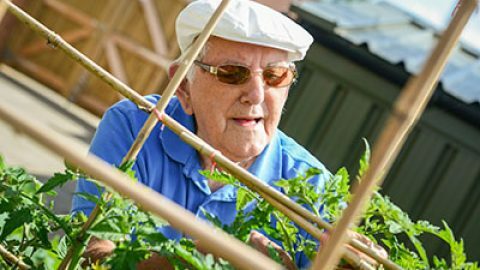 It is a great opportunity for residents to get involved with gardening and allows them to make the most of the fresh air. Each of our care homes competes against one another to see which has the best outdoor space in the whole Hallmark family! This activity is thoroughly enjoyed by residents, whilst they work together and feel included. What’s more, in our gardens we have raised planters to make gardening just a little bit easier. When we aren’t preparing for our competition, residents still have the opportunity to do some gardening, take a walk around our extensive gardens and take in the beautiful surroundings and wildlife. Having won the prestigious Pinders Healthcare Design Award for ‘Best Care Homes’ seven times, we provide residents with a thought-out place to live that has everything they could possibly need. For more information about the activities we provide in our care homes, don’t hesitate to get in touch with a member of our friendly team.